My feelings about The Well of Ascension, the second book in Brandon Sanderson’s Mistborn trilogy, were hard to pin down. The vast majority of the book is a solid 4-star read. But, the final few chapters are as good as it gets in fiction. During most of the novel, I was wondering if all the buildup and misdirection—we know Sanderson is going to tighten all those threads by the end—would pay off. Sanderson delivered. And, I’m here once again to sing his praises. At this point, I’m almost of the opinion that Sanderson can do no wrong. He’s a master of the craft. Even when he’s not at his best, his writing keeps me in a warm and cozy comfort zone. The story picks up a year after the events of The Final Empire. The Lord Ruler is dead by the hand of our heroine, Vin. Eland, her love interest, has been crowned king and set up a system of government with representatives for each group of people in the kingdom. Sazed is traveling and imparting his knowledge upon the former skaa slaves. There is now a religion that teaches about Kelsier, the savior, the man who’d given his life for the the cause. Luthadel, the city and seat of power that King Eland holds, is under threat by more than multiple enemies, one being his own father. 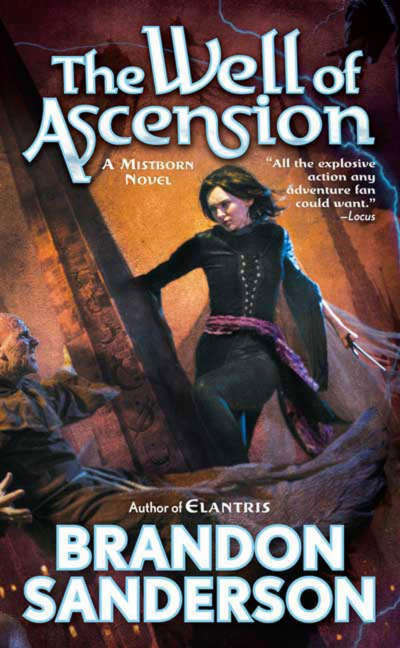 There’s a new and mysterious Mistborn in town. Oh, and you remember that tiny problem of The Deepness from the first book that we never got the full details on? The one that the Lord Ruler said he was holding at bay? Yeah, it might be back. Our merry band of thieves have now found themselves in new roles. They must learn how to hold an empire together or lose everything that Kelsier had fought and died for. The political maneuvering that took up most of the book’s plot was interesting. It was a sharp turn of events from The Final Empire. Overthrowing a government is one thing. Keeping one running may prove an impossible task. Much of the focus was on the politics of running and maintaining a kingdom with a war right at the front door. The Deepness and The Well of Ascension seem to be a secondary plot while everything else is going on. We’re only given bits and pieces throughout. While the new kingdom focuses on the threat of downfall in its infancy, no one has dealt with the much bigger problem underneath it all. Vin is still growing. But, those old feelings of distrust come back. I struggled a bit with is the teenage angst from Vin. Some of it is understandable because she’s a teenager who’s still trying to find herself. But, the self-doubt dragged on a bit for me. We’d already seen her grow from a scared girl who hides in corners into a powerful woman in the first book. She’s still one of my all-time favorite characters from any work. Is the payoff, the climax, enough to give this book the 5 stars I hold for only the most enjoyable reads? But, I must rate Sanderson against Sanderson. It was missing a little bit of the magic of the first book, but I’m excited to see where the third installment takes us.